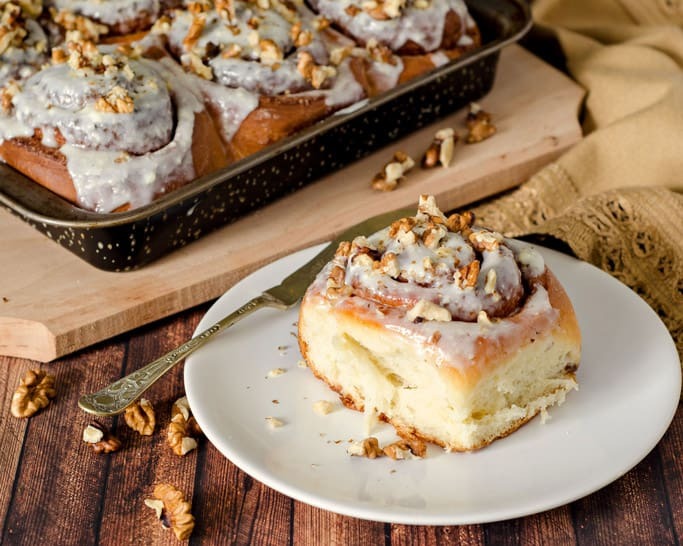 Moist and fluffy Homemade Cinnamon Rolls recipe. Homemade dough filled with cinnamon sugar and topped with vanilla buttercream frosting and walnuts. Guest Post: Recipe, writing and photography by Oana Iliescu from Pastry Workshop. Oana is a pastry chef whose passion for dessert pushed her towards writing a food blog that aims to create desserts with character, desserts that stand out, but are made from scratch, in her home kitchen. Apart from recipes, Oana shares on her blog information about the most common ingredients and techniques so if you want to delve into the world of desserts, visit Pastry Workshop or follow her on Pinterest or Instagram. If there’s one thing I don’t like when it comes to desserts and baking, that’s kneading and working with dough. But I learnt that conquering your fears and pushing over your limits is the best way to become a better baker or pastry chef and a better person altogether, therefore once in a while I challenge myself to knead the most amazing dough and make the best baked goodie I can commit myself to. It’s actually quite therapeutic to see how a simple mix of liquids, flour and yeast can come together into an elastic dough as gluten starts to develop, then rise and puff up only to be baked later on into fluffy, delicious goodies that flood your house with the most amazing scent ever! 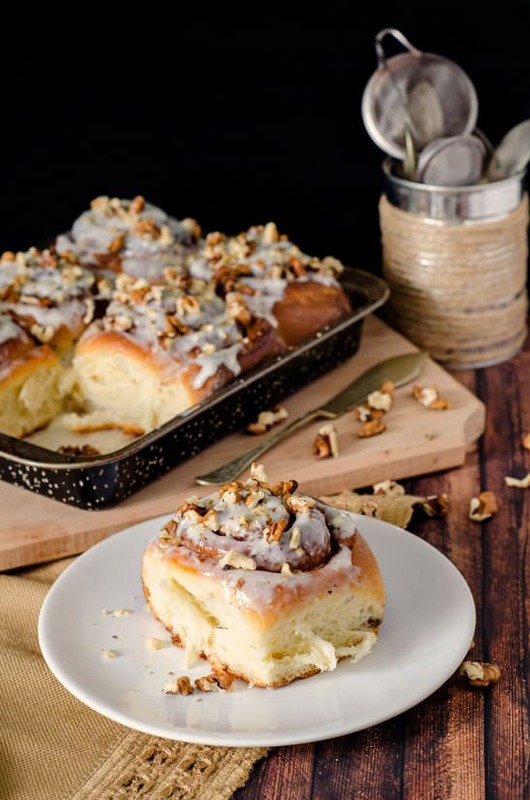 This time it was the turn of cinnamon rolls – these fragrant baked goodies are a family favorite, we love them to bits! And for good reason! 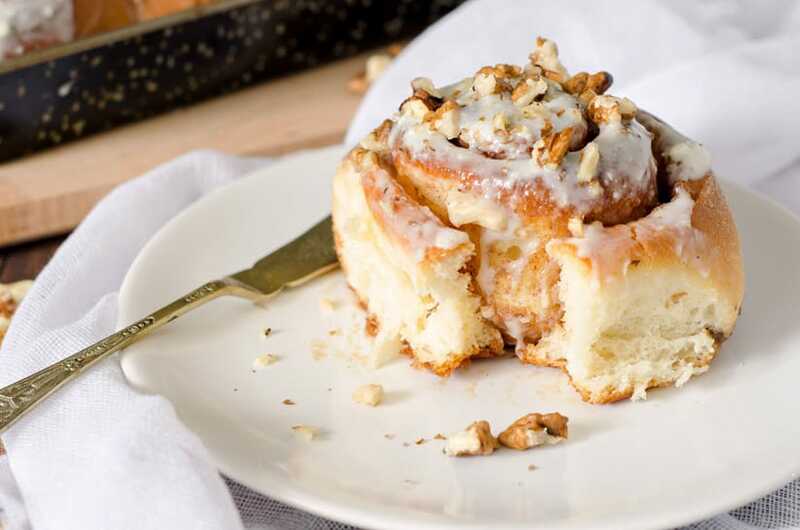 Imagine a fluffy roll studded with a mix of brown sugar and cinnamon, all topped with the creamiest, richest glaze ever, plus crunchy, rich walnuts for texture. A glass of warm milk next to it and you’re in the heaven of desserts and comfort food. It’s pure joy from the very first moment of mixing the dough to tasting it and it might actually make me love working with dough after all! Moist and fluffy Homemade Cinnamon Rolls recipe. Start by mixing the yeast with warm milk. Allow to proof for 10 minutes then stir in ¼ cup (50g) of sugar, the sour cream, eggs and vanilla and mix well. Add the flour then start kneading the dough, adding the melted butter gradually, while kneading. This can easily be done in a stand mixer or by hand. Knead for 5–10 minutes then place aside and allow the dough to start rising for 15 minutes. After 15 minutes, knead the dough again for 5 minutes then allow it to rise on room temperature, covered with plastic wrap, for 1 hour. You don’t need to knead the dough the second time, but I found that this yields an easier to work with dough that has an improved texture after baking as well. In the meantime, mix the brown sugar, white sugar and cinnamon in a bowl. Place the dough on a floured working surface and roll it into a 11x15 inch (40x30cm) rectangle. Spread the softened butter over the dough then top with the sugar and cinnamon mixture, pressing it slightly into the dough to make sure it sticks. Roll the dough on its length as tight as possible then cut slices of dough and place them with the cut facing up in a baking tray lined with parchment paper, allowing enough room to rise once again. Allow the rolls to rise for 30–40 minutes on room temperature. Pre-heat your oven to 350F – 180C. When it’s hot enough, place the rolls in the oven and bake for 30–35 minutes or until fragrant, golden brown and slightly crusty. The best way to check for doneness is to insert a toothpick in the thickest part of the rolls. If the toothpick comes out without traces of raw dough, the rolls are done. If you can still see traces of dough, bake a few more minutes then check again. When done, place the pan aside to cool to room temperature. Mix the cream cheese, sugar, vanilla and butter in a bowl until smooth and creamy. Spread the glaze over each cinnamon roll and top with chopped walnuts. Serve right away or store in an airtight container to keep them soft and fresh all the time. 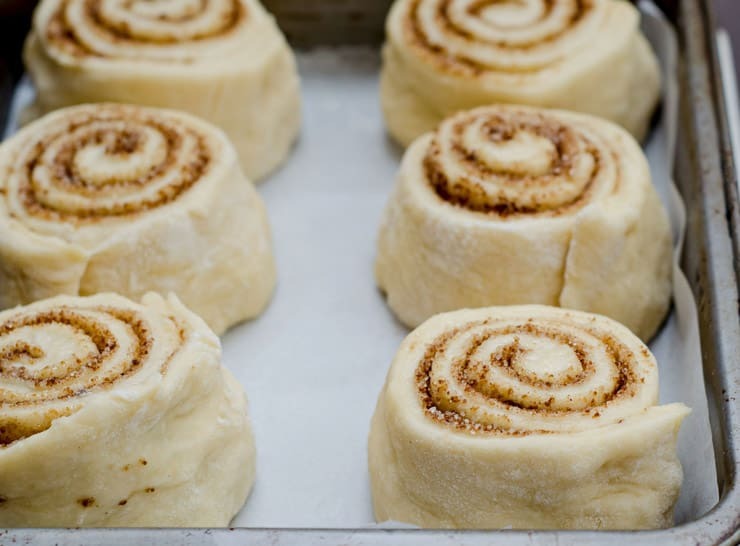 Have you made cinnamon rolls or homemade bread before? These homemade cinnamon rolls look amazing! I’m saving this recipe to try it out this fall. I can imagine not only the heavenly taste of these with a glass of milk, but also the warm, delicious scent filling my home. Oana, thank you so much for sharing your baking talents, photos and recipe. I’ll be checking out more awesomeness at the Pastry Workshop.. Thanks for the comment Denay and hope you truly enjoy them when you make it. Don’t forget the coffee! …as long as you’re a coffee drinker. YUM! Cinnamon rolls are my weakness. These look mouth-watering delicious! Me too Carly! Especially the smell. Oh my goodness. Your recipes always look delicious! Cinnamon rolls are my favorite so I’ll for sure be trying this recipe. Thanks for sharing! These look amazing. I have a go to cinnamon roll recipe but I love taking a look at others and tweaking mine. The buttercream frosting with walnuts sounds amazing!!! If you have a goto then that’s great, and hope this is comparable. I sure the toppings would make it even better! These look perfectly yummy. I haven’t been brave enough yet to try making home made cinnamon buns. I just might now. You and me both Tamara. I haven’t made bread and homemade pizza and pie dough is about as adventurous as I get. But I plan to change that. Thanks! That’s a tough decision, but homemade cinnamon rolls are pretty amazing. Hope you like them and thanks Kara! Ohh these sound amazing!! 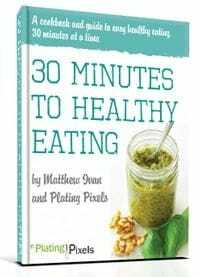 Pinning to try later – thanks for sharing your recipe!! You’re welcome and thank you for pinning Lindsay! ohh my husband would love these!!!! I’m pretty sure he would! Thanks Hayli! Haha guilty as charged. I usually do that too. Thanks Nancy!